This spring cycling trip was planned to celebrate our 30th wedding anniversary. It may not be the most conventional way to mark the occasion, but it suited us! 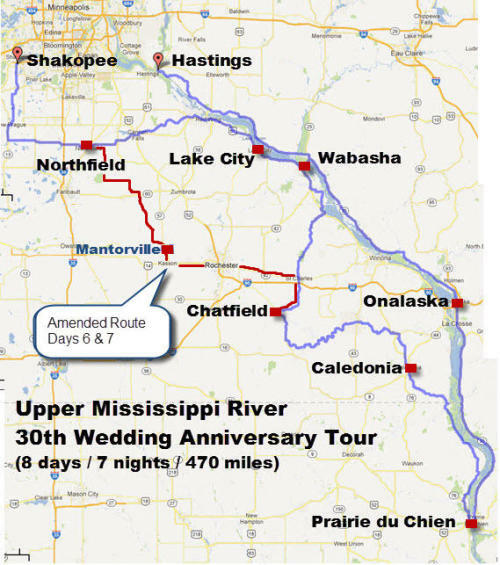 My husband, Rich, designed the route to cling to the Mississippi River, focusing on the upper sections and the bluff country. He also wanted to take advantage of some nice bike trails along the way. 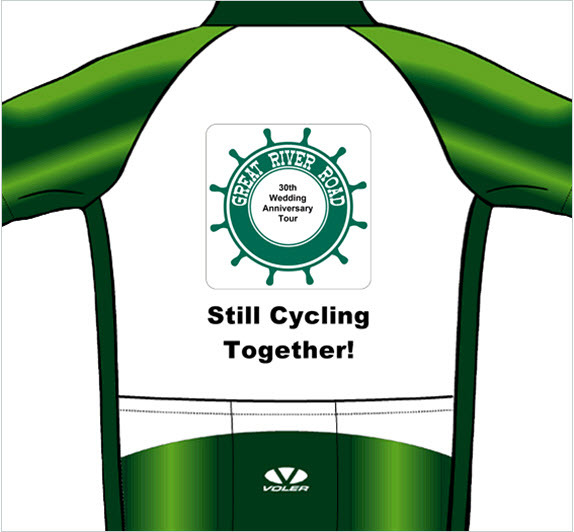 The first was the Great River State Trail which took us from Marshland to La Crosse along the river in Wisconsin. On our return through Minnesota, we detoured away from the river to take the Root River Trail through rural towns near the Amish country, from Rushford to Fountain. We intended to return to the Mississippi River and travel up to Red Wing to follow the Cannon Valley Trail along Cannon River to Cannon Falls. But not everything in life and cycling turns out as expected! Upon leaving Chatfield, unrelenting headwinds blowing unimpeded across the farmland slowed our progress down to a crawl. Since we were camping that night, we took advantage of our flexibility and changed course to a more practical cycling direction. We discovered historic Mantorville as a result, and were rewarded with SE winds the next day to push us onward. Our final leg took us to the Twin Cities, with the goal of reaching Shakopee by mid-afternoon on Saturday – cycling up to our daughter’s house where family and close friends had already gathered to cheer us home for an anniversary party and BBQ! Here is a day-to-day account of our trip. Total final mileage = 465 miles. Day 1: Prescott WI to Wabasha MN, 56 miles (Warm Showers home) – Cycling – From Thunder to Brits! Molly’s blog posts – All blog posts related to the Upper Mississippi River Cycling Tour, including those leading up to the trip and after thoughts. Rich’s view of the trip – He posted to the Crazy Guy on a Bike website, which is a widely used portal for long distance cycling trips. Scroll down to page to Table of Contents to find the individual posts.